Hello everyone! Today, I’m sharing a new project for Charlie & Paulchen! Charlie und Paulchen is a German company but they ship worldwide! If you don’t understand German, no worries! Just click to the UK flag on the top right corner of their website and all will be translated in English (or click HERE for the English version)! 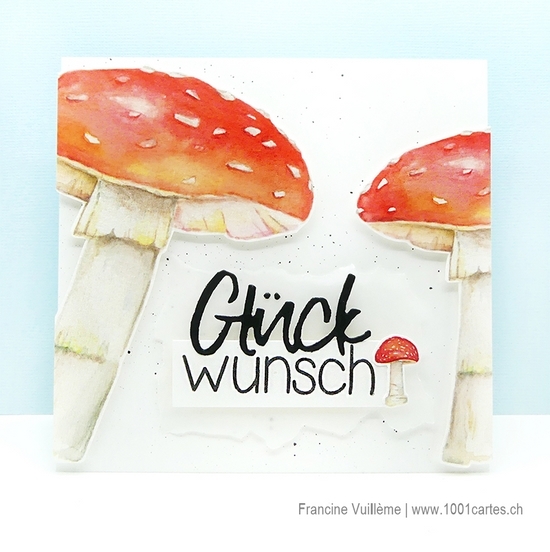 I chose the Toadstool Motifs Design Cardstock (Fliepi Auschneidebogen) for the two big toadstools and the Good Luck Motifs Design Cardstock (Glück Ausschneidebogen) for the small toadstool. I cut the mushrooms images with scissors. I used the German Glück set for the sentiment (Glück means luck). It’s a set that combines one die (Glücks…) and coordinating sentiment stamps. For more interest and layers, I fixed the sentiment to a piece of vellum. I adhered the toadstools with foam pads to the card front. For more inspiration from the other Design Team members, please head over to the Charlie & Paulchen blog! Very striking design, Francine! I love how you placed the toadstools and your coloring is just beautiful!